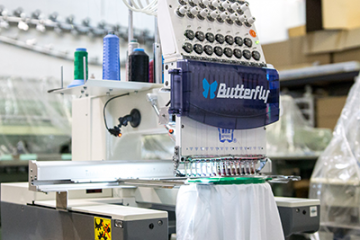 The Essential Package by Butterfly is the best priced commercial embroidery machine package on the market. The Essential Package has all the basics such as the cap system, tubular system, and stand. 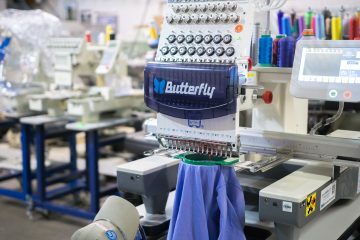 The Essential Package is our base model Butterfly 15 needle single head commercial embroidery machine. Who is the Essential Package marketed to? The Essential Package is a low cost option for those looking to get into the embroidery industry the most economical way or, for those looking to add to their embroidery departments. If the Essential Package is not for you, we offer several other embroidery machine packages to choose from. The Essential Package is perfect for self learners, DIY, or people already fluent in the embroidery industry. In order to keep the price so low, the Essential Package does not include training nor support. Again, we do offer other packages with full hands on training and extensive support. The Essential package has cut that out to save the end user. The machine has on board software with full monogramming but, does not have any additional software, saving the buyer even more. The machine comes with a warranty and will have all the hardware to start embroidering. Unlike our other packages, the Essential Package does not come with a starter kit so, make sure you have thread and all other consumables you might needed.